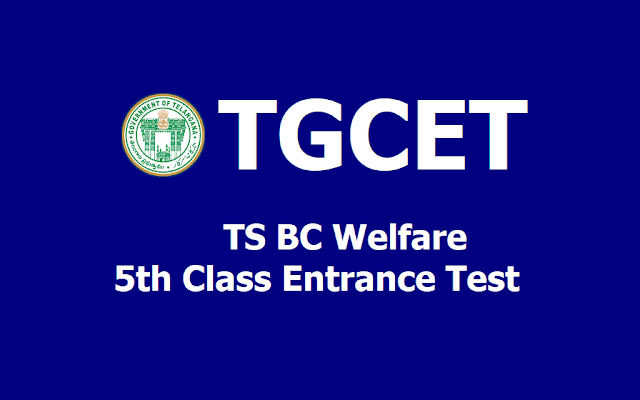 TGCET 2019 TS Gurukulams 5th Class Entrance Test 2019Mahatma Jyothiba Phule TS BC Residential 5th Class Admission Test 2019: MJP #TS #BC Welfare #5th Class Entrance Test 2019/ MJPTBCWREIS V Class Admission Test Notification 2019, TS BC Gurkulams CET 2019, TGCET 2019, Telangana Gurukulams Common Entrance Test 2019. TS BC Welfare 5th Class Entrance Test 2019, TSBCWREIS 5th Class Entrance Test 2019, TGCET 2019, TS Gurukul CET 2019, Telangana Gurukul CET 2019, 5th Class Entrance Test 2019, Telangana Gurukulam Common Entrance Test 2019, TS Gurukulams 5th Class Entrance Test 2019 , TS Gurukulam 5th Class Entrance Test 2019. Telangana State Mahatma Jyothiba Phule BC Welfare Educational Institutions Society has issued MJPTSBCWREIS 5th Class Admission Notification 2019 in February 2019. This Entrance Test Notification 2019 for admissions into 5th class (English Medium) in TS MJP BC Welfare Residential Schools in the Telangana State for the academic year 2019-2020. The MJPBCWREIS invites online applications from the eligible candidates for admission into 5th class in its MJPTSBC Welfare Residential Schools. TGCET 2019 is a Common Entrance Test for Admission into 5th Class for the academic year 2019-2020 in TREIS, TSWREIS, TTWREIS, MJPTBCWREIS 21st Century Schools. TG Gurukul CET (Telangana Gurukul CET) would be conducted in every for 5th class admissions in TREIS, SC, ST, BC Gurukulams. It is one entrance test for all gurukulam admissions in Telangana State. TGCET ~ TS Gurukulam 5th Common Entrance Test(Residential School's Common Entrance Test) 2019 notification has been announced on 15th February 2019 by TSWREIS Officials for admission in SC, ST, BC Gurukulams. Online application forms submission from 17.02.2019- 16.03.2019 duration for application. The Telangana Government will fill the 240 seats in newly sanctioned in 119 BC Gurukulams. The Students should be a bonafide of Class VI during the academic year 2017-2019 in any Government School or any recognized school of Telangana State. Before filling the application, read the prospectus carefully. Candidates can submit application form online through website tgcet,cgg.gov.in. There is a Rs.50/ registration fee for submission of online application. TGCET Labels in TGCET 2019, TS Gurukulams 5th Class Common Entrance test 2019,TG Gurukul CET 2019,TS Gurukulam 5th class admissions 2019, Telangana Gurukulam 5th class Common Entrance test for Telangana Gurukuls, TS Residential Schools 5th Class admissions.